The average reader will spend 1 hours and 20 minutes reading 8 Class Pets + 1 Squirrel ÷ 1 Dog = Chaos at 250 WPM (words per minute). Twitch, the school yard squirrel, has really gotten himself into a bind this time. While trying to escape from a hungry owl, he roused Cuddles, the principal's dog, and got chased into the school. Now he's locked in for a disastrous and hilarious night. Can Green Eggs and Hamster, Sweetie the Library rat, and the other school pets save Twitch from the crazed Cuddles? 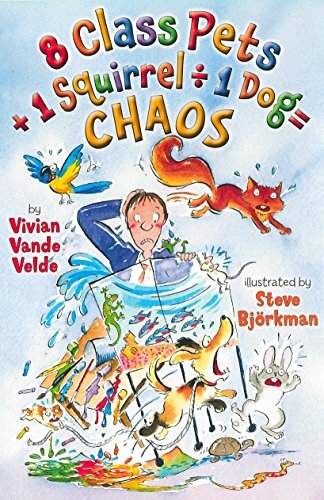 In this laugh-out-loud funny chapter book, a group of small animals manage to turn an elementary school into a real zoo.